The Knitting Factory's Hollywood location, a fixture on Hollywood Blvd. since 2000, closed its doors in the wee hours of Oct. 26 after the three-stage club held its final shows Oct. 25. 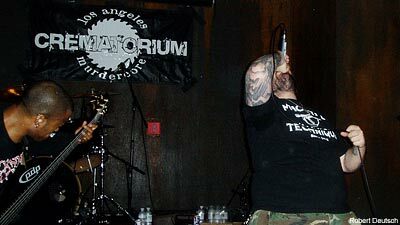 In attendance were supporters of the Los Angeles metal scene, industry personnel and Church of the 8th Day, vehement supporters of the local and national metal scene, and promoter/booking agent for many of The Knitting Factory's extreme metal shows since 2005. "It's a sad end of an era," Dan Dismal, head of Church of the 8th Day, told Noisecreep about the venue's closure. "It sets us back about seven, seven and a half years. Nobody's been a metalhead since conception ... The Knit was the best thing to happen to metal, to punk and underground hip-hop here." With a lineup in the venue's Front Stage room, local bands Eat the Living, Daemos, Hell Hath No Fury, Letum Ascensus and Crematorium all said goodbye to the venue that frequently showcased local talent in a friendly manner -- according to Dismal -- while also showcasing national and international extreme metal acts. During the stage-opening Crematorium set shortly after 11 PM, Dismal -- also the band's frontman -- recollected, "Remember all the [Los Angeles] Murderfests? Obituary playing here when they were still broken up, Atheist coming back, Eyehategod's first West Coast show in seven years? Remember all the good times you guys had here?" Answered to a swath of cheers, raised beers, and surrounded by more than a handful of somber people remembering the good times at The Knitting Factory throughout the night, Dismal was not alone in his fondness for the venue. As a jack of all trades first starting out as a fan, then evolving into a member of the booking scene at clubs throughout the Los Angeles area -- while also devoting time in a touring band -- Dismal's take on the demise of The Knitting Factory was an all-encompassing one. "It's one less cool place to hang out, and one less friendly venue to play," Dismal told Noisecreep. "They don't take merch cuts from bands, the sound guys really care, and security is cool. You really gotta do something wrong to get kicked out."